That every person has capacity is a self-evident reality. 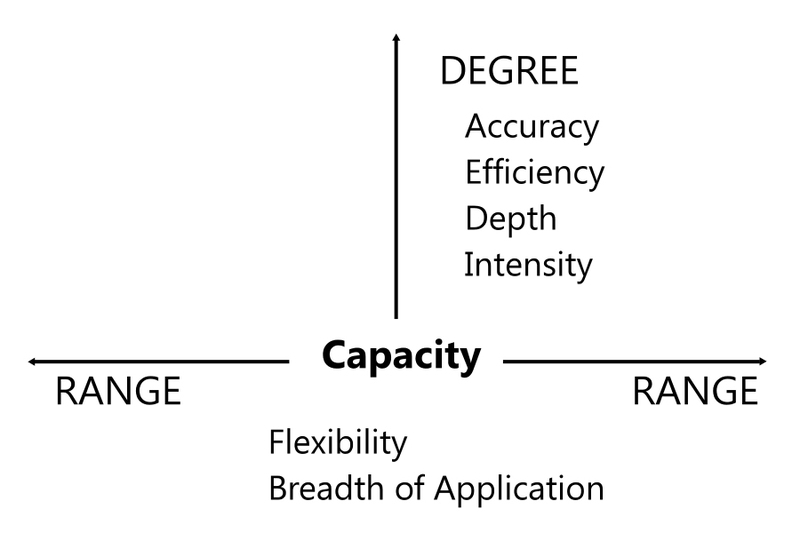 As used here, capacity refers to one’s ability to do, to think, to believe, and to feel. Doing and thinking are both ways of acting. To act by doing is to interact with the external world. To act by thinking is to interact with the contents of one’s mind and soul. Thus, capacity to act refers to the extent of one’s ability to interact with both the shared external and the private internal worlds. Similarly, capacity to believe is the extent of one’s ability to hope, to dream, or to have faith. Belief determines the self-prescribed bounding limits of one’s actions. Capacity to feel is the extent of one’s ability to connect with people, events, places, or things. Feeling determines both the depth and richness of one’s experiences. Habits are automated patterns of doing, thinking, believing, and feeling. Just as capacity can be increased through the process of learning, so too can habits be established; and they can be changed. 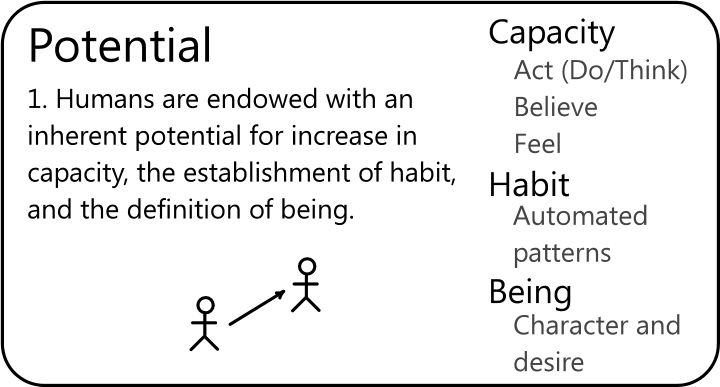 Not only does the human potential allow for increase in capacity and establishment of habit, but even the very being of a person can change. As used here, being refers one’s character, nature, and perpetual desire. Thus, learning is the process by which a stable and enduring increase in capacity, the establishment of habit, and the definition of one’s being, is produced.